Can you get my favorite beer from Gainesville? Maybe. We’re always reaching out to breweries to see about bringing in their products. 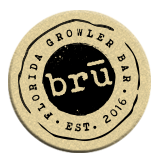 However, Florida’s 3-tiered distribution system requires that all craft beer be sold through a distributor. If your favorite brewery has a contract with a distributor AND that distributor can sell in our county, then the process is easy. If not… then they can still be part of our New Brew Tuesday where we give away free 4oz pours as long as we’re somehow able to fill a few growlers with their brews.